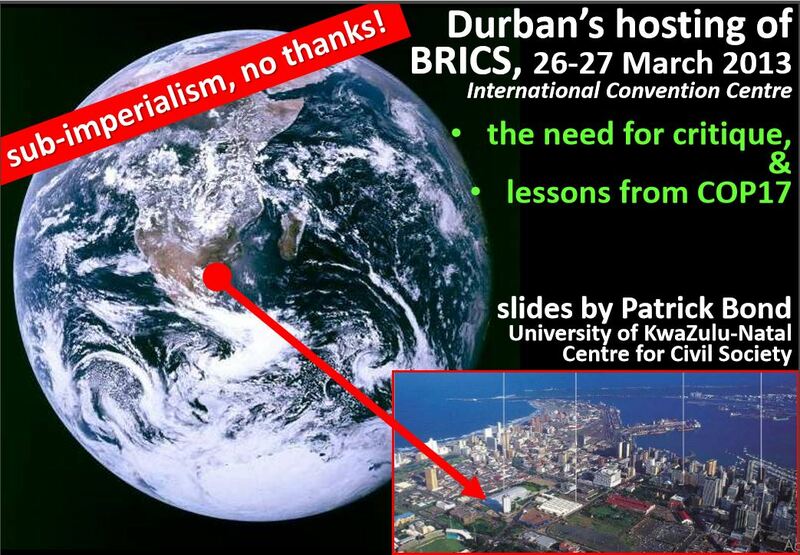 BRICS in Africa anti-imperialist, sub-imperialist or in between? Introducing Brics from above, and brics-from-below: A Brics reader for the Durban Summit In Durban, South Africa, five heads of state meet on March 26-27 2013 at the International Convention Centre, to assure the rest of Africa that their countries’ corporations are better investors in infrastructure, mining, oil and agriculture than the traditional European and US multinationals. The Brazil-Russia-India-China-SA (Brics) summit also makes space for 16 heads of state from Africa, including notorious tyrants. A new $50 billion ‘Brics Bank’ will probably be launched. There will be more talk about monetary alternatives to the US dollar. There is a burgeoning literature on the (re)emergence of the BRICS countries – Brazil, Russia, India, China and South Africa – as significant actors in international development. To date, however, most attention has focused on the government-to-government relations established through state-led South–South Development Cooperation (SSDC) and the BRICS’ engagements in multilateral processes. Much has also been written about the growing presence of businesses from the BRICS (especially China) in poorer countries, particularly in Africa, and the somewhat tendentious and superficial slant that initially characterised much of this work is now starting to give way to a more nuanced analysis of the multiple roles played by such businesses in different places and sectors (Brautigam 2009; Mohan 2013; Navas-Alemán 2015). 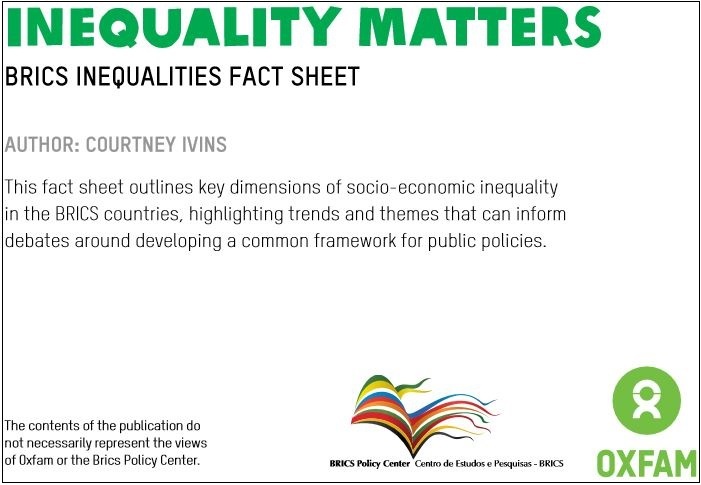 By comparison with this growing literature on governments and businesses, remarkably little attention has been paid to the roles played by civil society actors from the BRICS countries by researchers from outside those countries themselves.1 In this report we will argue that this has led to a neglect of both their existing and their potential contributions to the ongoing transformation of the field of international development, amid the broad geopolitical shifts symbolised by the rise of the BRICS.